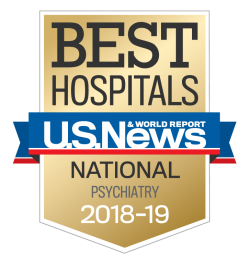 The Psychotic Disorders Unit is a crisis stabilization unit; individuals come into our care when experiencing a psychotic/delusional episode that cannot safely be managed outside of the hospital. Family members will often notice alarming behavior in their loved one prior to hospitalization, such as paranoia, wandering into traffic, aggression, or individuals seeing or hearing things that are not there. We treat individuals with diagnoses such as schizophrenia and bipolar disorder, and our team has deep expertise in treating people who are experiencing psychotic symptoms such as hallucinations and delusions. During each individual’s stay, we focus on crisis stabilization so that they can move back into their home community, or a less-intensive level of care, as quickly as is safely possible. The average length of stay on the Psychotic Disorders Unit is seven to ten days.